The short-term solutions to injustice in the nail salon industry are worker organizing and more regulation. 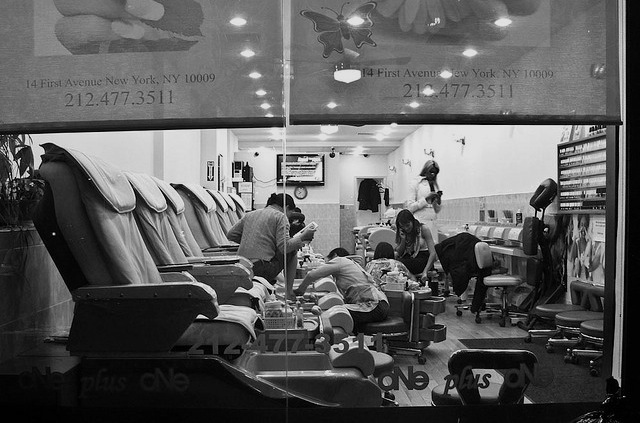 Last Sunday, the New York Times released a fantastic investigation detailing the awful abuses workers in New York City’s nail salon industry endure, including wage theft, dismal pay, and exposure to toxic chemicals. The series was so powerful that even New York Gov. Andrew Cuomo, hardly a friend of workers, apparently felt obliged to respond with some policy measures, as did New York City Mayor Bill de Blasio. Not so fantastic, however, was the list of suggestions the Times offered concerned nail salon consumers. While needed, it was full of bad ideas — including, for example, the suggestion that you talk to your manicurist about her working conditions. But acting on this advice could well get her in trouble with her boss — who could be listening in — or add stress to her day by making her feel obligated to reassure you that your pedicure isn’t unethical. Treating your manicurist like a human being is great. Demanding she listen to your inner Barbara Walters or face the fear of a lousy tip is not. The New York City nail salon industry has been horribly abusive for a long time, because of the vulnerability of immigrant workers and the toxicity of the products. Also, as the Times points out, it is relatively easy and cheap to open up a new salon — meaning there are too many such businesses. Fierce competition means low prices and low wages; it also means that owners must cut corners in any way so they can stay afloat. The Times comment page — and my Facebook feed — has been awash in vows to foreswear the manicure forevermore. It’s not surprising. When American consumers learn about issues like this, most decent people’s reaction is to boycott the offending business or industry. The impulse not to be complicit in human suffering is commendable, but misguided. It assumes that you can simply find nice industries to patronize. But you can’t — that’s what makes capitalism such a lousy system. The urge to wash your hands of the problem by boycotting also has a practical catch: it won’t help the workers. If workers organize and call for a boycott of their employer for specific strategic reasons, consumers should follow their lead. But otherwise, a spontaneous boycott may simply cause workers to lose their jobs — or in this case, a lot of customers who were probably pretty good tippers. Boycotting nail salons could also add to the economic pressure on these businesses, making it even more difficult for them to pay workers decently or buy needed ventilation equipment. The Times list was a step beyond that, but still not much help. Here’s a better list for well-groomed and socially responsible New Yorkers. Support workers groups who are already organizing. Minkwon, located in Flushing, Queens, organizes mainly in New York’s Korean community and provides a variety of services to immigrants (including those with limited English proficiency). While they do not currently have any campaigns focused on nail salons, they provide legal services to workers for workplace issues like wage theft, safety, unemployment, and worker’s compensation. New Immigrant Community Empowerment (NICE) organizes immigrant workers and has a campaign underway concerning employment agencies, which promise to help people find jobs for a fee, but in many cases simply pocket the money and either connect workers with below-minimum-wage work (like that at many nail salons) or none at all. As part of the Justice for Job Seekers Coalition, they are calling for legislation to help change this practice. Groups like these are putting workers’ needs first, as well as identifying ways that salons can be better for consumers. And if the price goes up or your manicurist starts wearing a mask and gloves, don’t complain — change is probably for the best. A number of groups have formed the NY Healthy Nail Salon Coalition and are working together for local policy changes. You can do the same by contacting your city council representative and asking her to support Intro 304-A, a bill introduced by Public Advocate Tish James to improve the health of nail salon workers. You can also reach out to your state legislator and ask that she support the Justice for Job Seekers bill, A.3702/S.3415, in the New York State Legislature. You should also contact Cuomo’s office, and pressure him to do more than simply create a task force. Adhikaar and the New York Committee for Occupational Safety and Health are calling on the governor to increase the number of inspectors dedicated to this industry. Charlene Obernauer, executive director of the New York Committee for Occupational Safety and Health said in response to Cuomo’s announcement: “All agencies working together in a Task Force to address this issue does not add additional staffing to actually monitor health and safety in the salons.” They have called for representatives of worker organizations to be included in the governor’s task force, a call that you can echo. Across the country, stronger protections for undocumented immigrant workers would help people in nail salons and many other industries that pay low wages and create unsafe working conditions — and then rely on the fear of deportation to keep migrant workers from speaking out. Increase demand for non-toxic salons and products. Consumers can’t solve this problem simply by being better consumers. However, workers would likely suffer fewer health issues if we demanded that salons use non-toxic products. Ask your local neighborhood salon to switch to non-toxic brands of polish and remover. If they won’t, take your business to any number of the organic toxin-free salons popping up around the city. A great resource on healthy cosmetics is a blog called Hey Girl What’s On Your Face, written and researched by a professional makeup artist; the author has just posted recommendations for healthy products and local salons this week. The Times did a service in noting that tipping well doesn’t address the injustice of low pay, as many owners steal workers’ tips. And the fact that the convention of tipping even exists reflects the level of economic injustice in our service industries: low pay is expected, so the customer must pitch in if the worker is to make a better wage. We all deserve a system in which workers don’t have to rely on the whims of customers to make ends meet. But Adhikaar’s pamphlet for consumers is helpful for the immediate term: “Tip big!” (at least 20 percent), the community group advises, but do so in cash — placed directly in the hands of the person who helped you — to prevent it from being stolen by the boss. Don’t be fooled by those discreet little envelopes salons provide for gratuity and then keep at the register — these look like a genteel way to avoid an embarrassing transaction, but can enable tip theft. Don’t forget that New York City is full of abusive industries. No, you aren’t going to strike a bold blow for workers’ rights by abstaining from getting your nails done, nor by deriding people — mainly though not exclusively women — who enjoy such small indulgences. Do you ever order takeout? Go to a carwash? Hail a cab? Yeah, we thought so. Horrible exploitation exists in all these industries. The short-term solution to all of these problems is the same: support workers organizing and call for more and better regulation. Liza Featherstone is a contributing editor at Jacobin, a freelance journalist, and the author of Selling Women Short: The Landmark Battle for Workers’ Rights at Wal-Mart.